I’d say awesomeness achieved. Even the door looks more like it belongs to a 1920s bungalow now. 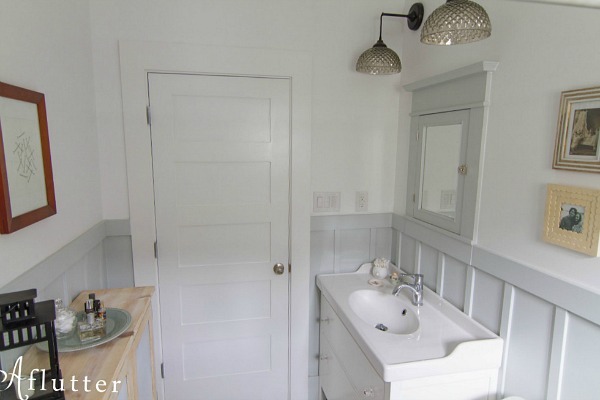 I think one of the smartest things Sarah did was rework the layout of the room so that the shower is on the back wall and the toilet is next to the sink. This was the first tiling project Sarah had ever tackled. 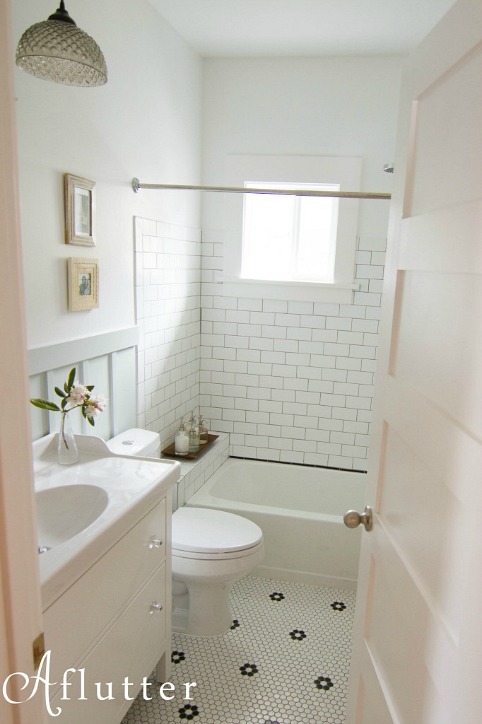 The subway tile gives the room a classic look that suits an old house like this one, as does the trim around the window and woodwork she added around the room. I totally get what she means. I’ve had similar feelings about changes in my own home. There can sometimes be an “adjustment period” after it’s done, even when you’re happy with the results! Thanks to Sarah for sharing her bathroom with us. 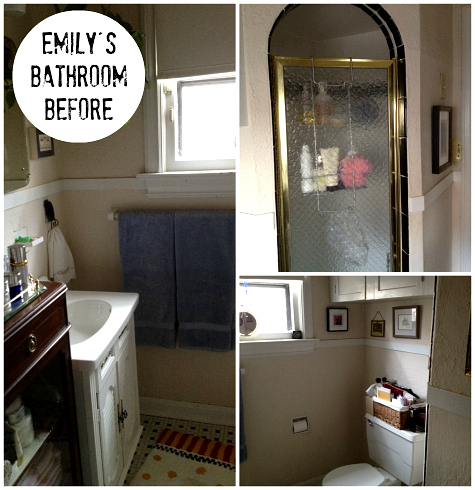 Visit her blog Aflutter to learn more about the bathroom remodel and see the rest of her house! What a fantastic job! I am very impressed. I love the new bathroom. I love, love, love that flooring. I wonder if Sarah would tell us where she got it? I do, too! She may give that information in her blog post about it if you click over to Aflutter.She has lots more details about the remodel there! Ahh yes, the reconciling of initial plans with the compromises needed to be made. I know the feeling all to well. Whether it’s availability of materials, cost prohibitive, “my old house syndrome” aka your idea is great, it has worked for others, it could work in a different house, but not in your old house. And so becomes the time of your DIY project where you learn to love what your old house was able to become. 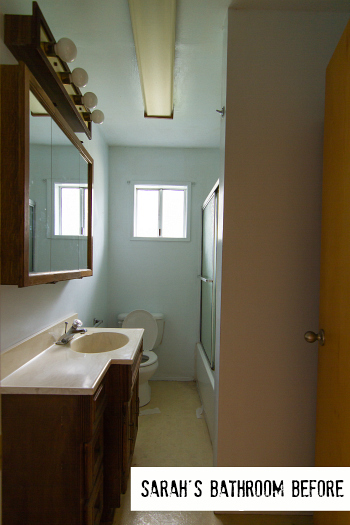 For the record, I think the bathroom is a stunning Reno. Well done! What a fabulous job! Reconfiguring the room was so smart and not a small task to move all that plumbing, I’m sure. 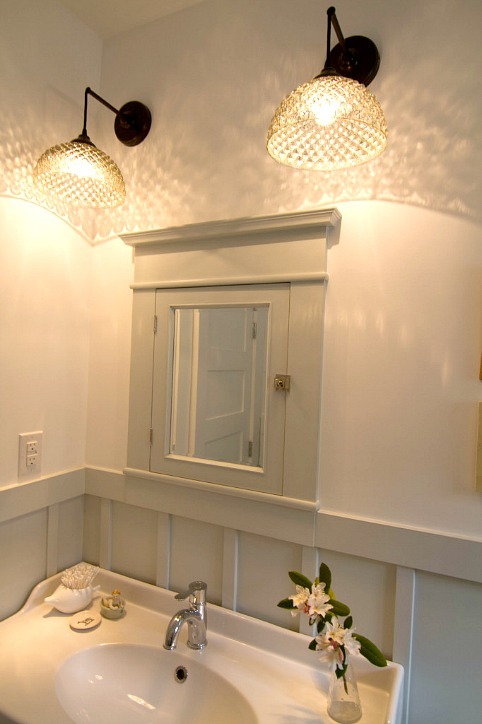 I love it all, but especially those hobnail glass light fixtures! 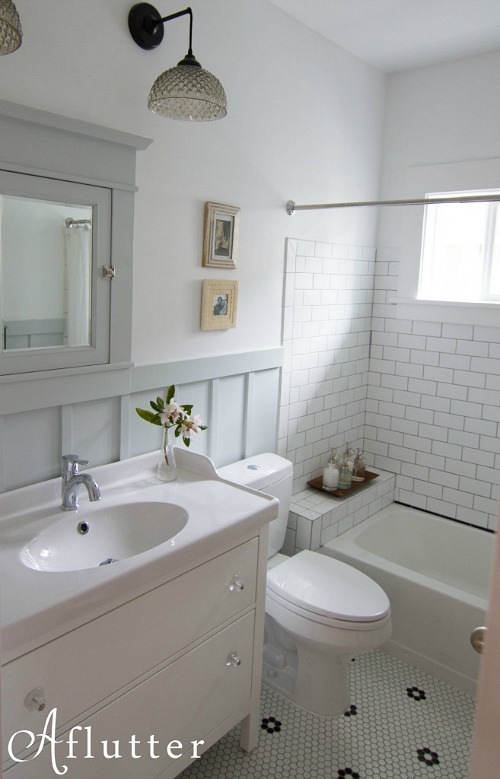 We’re using the same IKEA vanity + (to me, old-fashioned-looking) countertop in our main bath . . .
. . . along with similar “flower” tile flooring, which we got from, believe or not, amazon.com! If you have vintage tastes, it’s not always easy finding what you want at the big box or local stores, but you’d be surprised what you can find via amazon. A wonderful job with that bathroom! That is a night and day transformation. I wonder what steps she took to protect the wood molding around the window from moisture? Thank you Sarah for the reply, I appreciate it. 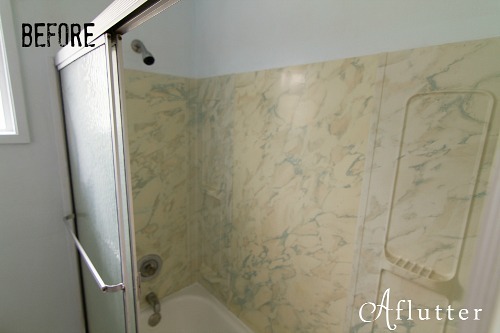 I am currently remodeling my In-laws home that has a glass block (screams 1980’s) window in the shower, and I want to replace it, so I was interested in how you worked it in yours. Thanks again! Awesome makeover. I’m always impressed when a homeowner tackles tricky jobs like tiling. I totally get what she says about not being 100% thrilled knowing the little mistakes, compromises, etc. We have two 1920’s baths that I’ve tried to keep with a vintage black and white look and original fixtures (except toilets). Recently had to have new faucets added downstairs and whole new plumbing lines upstairs (we’d done the lines earlier downstairs). So many little things that bug me – like edges of tile chipped when the contractors re-grouted that set my teeth on edge. But just looking at the bath in general, it looks good. Upstairs they had to drill through concrete that nobody knew was there – a total mess. 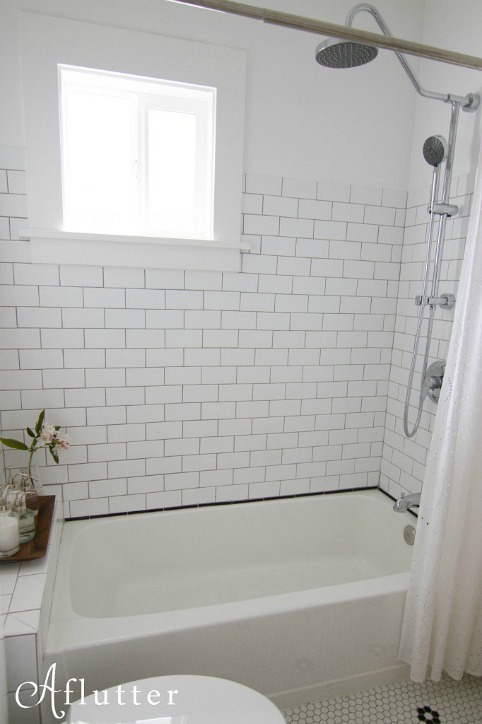 But anyway we got through it and I still have two 1920’s baths that function, though one is really tiny. I hope that whoever buys our house when we put it on the market likes a vintage look. Absolutely superb renovation! I can’t believe that is her first attempt at tiling. Wow! I am totally scared of tiling so I admire anyone willing to give it a go – in a bathroom no less. I love just about everything about the after. The floor, the sink, those lights, yep, love it all!! That’s okay, I’ll totally love it for her. It is what it should be now, and it makes me feel so at home and so good just to look at the photos – I love it! This new bathroom is so pretty. BreAnne did such a lovely job! I tiled my bathroom floor a month ago and while not too hard, it definitely took more time than I thought it would. I bought a mini wet saw a few years ago when I did the upstairs bathroom because I knew I had lots of tile work to do. It has worked very well. If anyone is going to tile an area that gets wet, like a shower, or bathroom floor that has a tub or shower in it, I recommend the John Bridge Tile forum. The people there very nicely will help anyone, even a complete novice, step by step through their project. There are important things about waterproofing that I did not know – like that tile and grout are not “waterproof” and waterproofing needs to be done before the tile goes in. BreAnne had a contractor gut the bath to the studs, so this was probably done, but a DIY might not know that. I haven’t heard of that forum before. Thanks for the tip! I commend anyone who uses mosaic flooring in their bathroom. But, not me. The thought of cleaning all that grout makes me hyperventilate. Even epoxy grout has crevices the dirt can accumulate in. 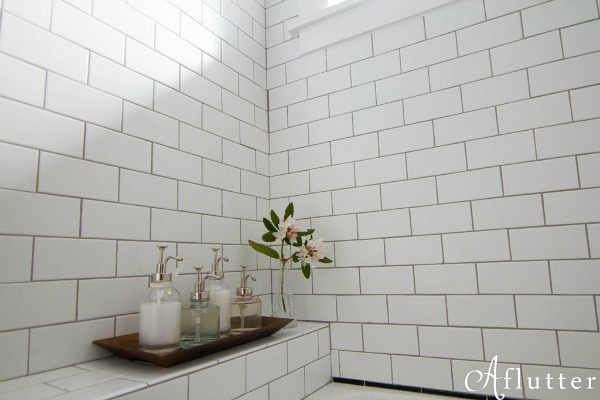 I’d love, love, love to see a bathroom that looks nice, but uses materials other than tile. What kind of material would you use instead of tile? I dunno! I just know I hate tile, and those acrylic surrounds. I don’t know what I want, but I want something that is extremely low maintenance. My husband is a country boy and as much as I tell him not to, he’ll go outside bare foot, then when he gets into the bathroom, it’s like all that dirt falls off onto the floors and into the grout. I am completely over oxy-clean and scrub brushes. I hear ya. It can be a pain to clean, especially with white grout, I’ve found. 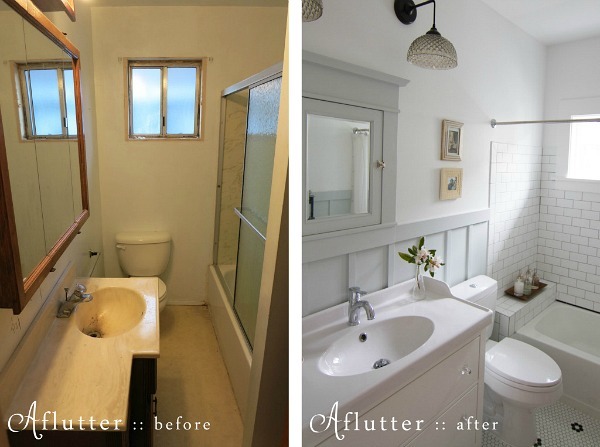 Beautiful bath remodel! And I totally understand about the “adjustment period.” That’s one of the great things about getting 3D renderings of your remodel plans, though — you get to see it BEFORE you build it! A chance to get used to the new look in advance, plus the confidence that you know exactly what the end result will look like (compromises and all). Love my work!! Can you give us a link to her blog? Wow! It’s adorable. Every detail is perfect. Thanks for sharing! Well, that is a winner. What a beautiful job. Glad someone asked about the window because I have a wood window in my shower and trust me, it has got to go. Fiamma, I’ve got a window in my shower, too .. since it’s single source of natural light in that room, I decided to keep it w/ a simple “fix”. While not the most convenient, it works for me and the finished “look” is nice! 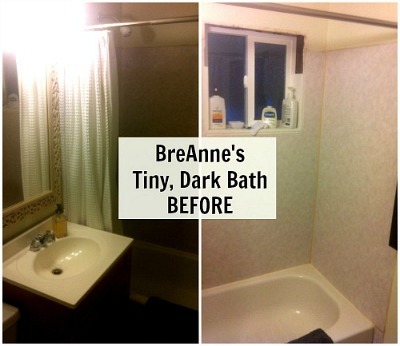 Instead of using a shower curtain, I had stationary curtains made — a gathered panel on either side of the tub/shower with a valance in-between. I have a shower liner (w/ rod) at the front of the tub/shower, where you’d normally put the shower curtain, and a 2nd one (w/ a 2nd rod) that’s at the back of the shower. If I have company or am enteraining, I just pull the back liner (w/ rod) to the front and hide t\each liner behind one of the two curtain panels. The valance hides the rods. This looks great! So impressed she can tile! Thanks so much for sharing Julia. 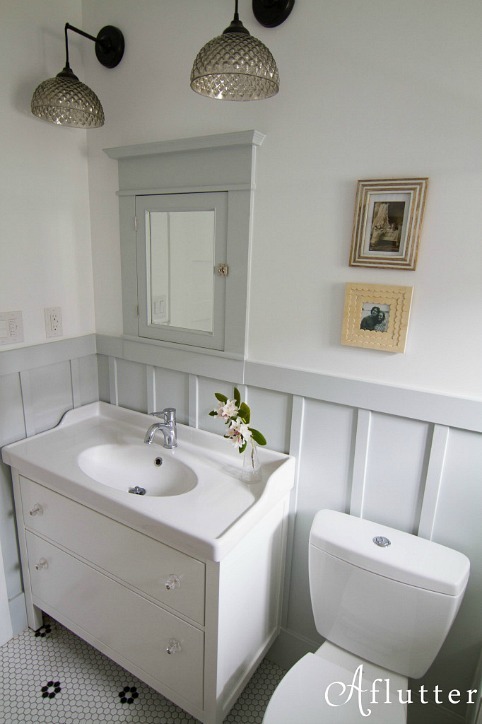 Love the vintage style and wainscot walls. She did an amazing job!! Well done! Wow! That’s my favorite kind of before and after. 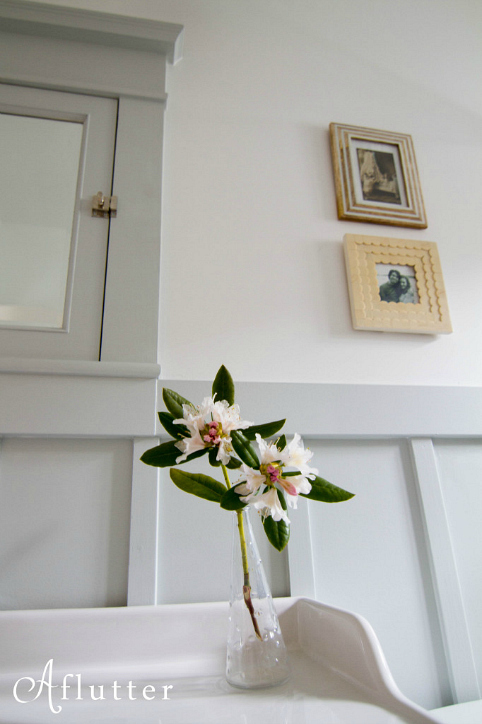 When someone takes a blah modern-but-dated room and makes it looks truly vintage. Nice job, Sarah! Amazing job! I love all her choices — will have to check out her website to see where she got everything! 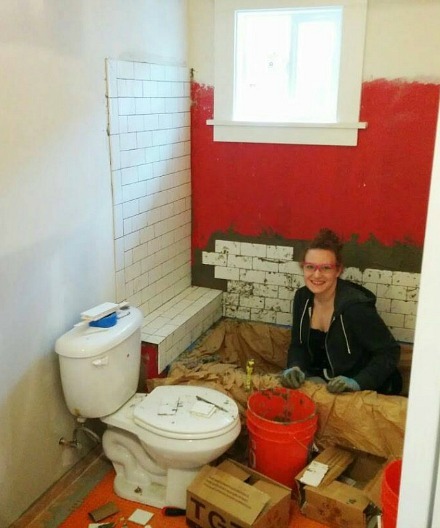 One question, though, since hers is a single bathroom house — what creative solution did she come up with during the demolition and renovation? Good question, Maggy! That would definitely be a challenge. It says on Sarah’s site (sorry I got the name wrong before) that her contractor very sweetly put the toilet back every night! Thanks, Jeanne .. did she mention what they came up w/ for showering? Guess I need to check out her website! Hi guys! The contractor was so nice and accomidated our toilet needs, like Jeanne said, but luckily we have a gym membership to a gym with showers less than ten minutes away. I was so thankful, especially when I was covered in paint and who knows what else and had to go in to work! Sarah, wow. You go, girl. I love it. Such a great blend of new and old styles and how great are those lights?! Wow, lovely work! The ‘after’ bathroom looks so much better! 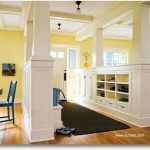 What an insightful post, which gives the room classic look .Your woodwork, is awesome. What a fantastic job! I am very overwhelmed. I love the new bathroom. Hi Leslie. The sink is wonderful! It is so easy to clean because it is all one piece. Plus the plumbing it comes with is super compact, so the upper drawer and storage isn’t effected at all. I also like the vanity cabinet we got. It has slow close drawers which are nice. But my one complaint, which only applies to the size we got, is that the drawer knobs are too far apart 🙂 Overall? I love it, and have already recommended it to friends!